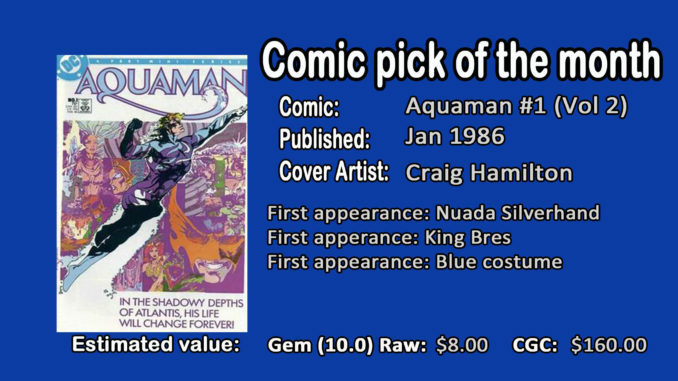 In anticipation of DC’s latest movie installment, we have listed here Aquaman #1 (Vol 2). This comic was published in January 1986 and features cover art by Craig Hamilton. As the volume 1 edition #1 is a bit pricey (irregardless if the movie is good or not) this comic is a bit more affordable. What’s most remembered about this comic is that Aquaman is NOT in his iconic orange and green costume. Instead, his costume is blue and has been redesigned. As this is a copper age comic, Hicollector recommends you get this comic at 9.0 or greater.